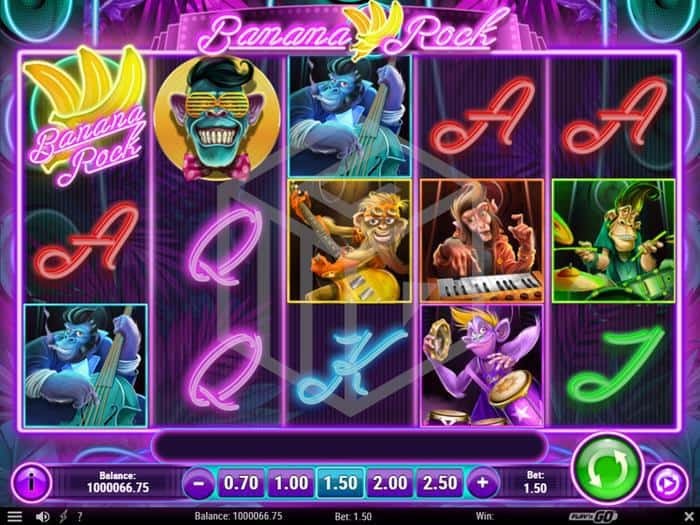 Rock ‘n’ Roll is a popular theme for online slots (think Guns 'n Roses, Megadeath, Jimi Hendrix etc) but we’d never seen one featuring a supergroup of simians before Play ‘N Go decided to create Banana Rock, a 5x3 reel, 10 fixed pay line, high variance slot with a maximum win of 2,500x the bet size and an RTP of 96.6%. 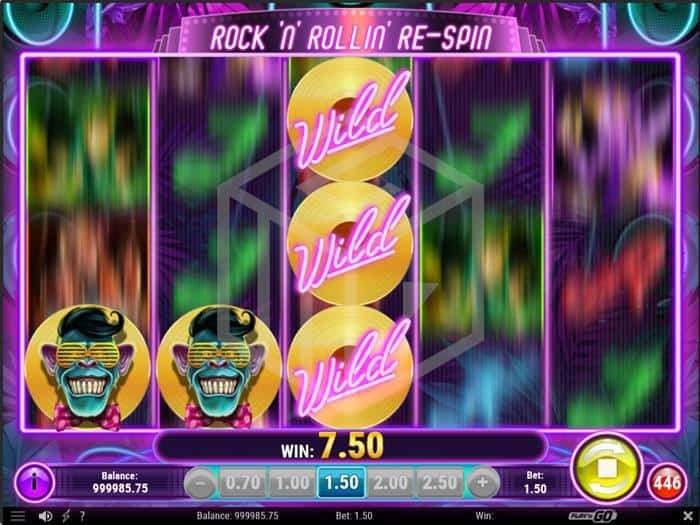 With special wild respins and a free spin round with some nice little extras, Banana Rock can be played from between €0.10 and €100 a spin. As you can probably imagine from a slot with rock star monkeys as their central characters, the design of Banana Rock is fun and funky. Two pairs of huge green speakers sit either side of the neon-framed game board to resemble a late 80’s rock venue called – you guessed it – Banana Rock. Large tropical plants can be seen sprouting from the ground either side of the board just to remind you that this Rock venue is in the middle of the jungle. The soundtrack is of a repeated rock riff interspersed with bursts of guitar (to signify a win) and the occasional baritone ‘Oh yeah’ when the lead singer wild lands. The lower value symbols are taken by the standard J, Q, K, and A (all in fluorescent neon of course) while the 5 higher value symbols are all monkey members of the Banana Rock group; the purple bongo player, the blue bassist, the orange keyboard player, the green drummer, and the yellow guitarist who is the highest paying symbol with 5 in a row worth 60x the bet size. All band member symbols can also appear as full reel symbols as well as single square symbols. The wild is a headshot of the lead singer of the band with his Elvis quiff, pink spotty bow-tie and a pair of yellow shutter sunglasses, all on a yellow circular background. The scatter symbol, which only appears on reels 1 and 5 is the banana rock logo. If you land two or more lead singer wilds in one spin then the wild nearest the right-hand side of the board will move vertically then horizontally across the board until it meets the wild closest to the left – along the way each square the wild passes is transformed into another wild. When the two wilds meet a respin is awarded the additional wilds staying in place for the duration of that spin. Land the scatter symbol on reels 1 and 5 and you’ll be awarded 10 free spins. Each time you land a scatter symbol during the free spin round you will be awarded one additional free spin. If you trigger a Rock ‘n’ Rollin’ Respin during this round the respin will not affect the number of free spins you have left. If you land a full reel band member symbol during free spins (each band member other than the singer has one reel where they can land stacked) then that band member will now have an additional multiplier added for any wins involving them. Land the same full reel symbol and another multiplier will be added to that band members winning combos up to a 5x multiplier per band member. After the free spins have been completed the Encore Spin will now take place. The Encore Spin only features the band member symbols and you are guaranteed a win of some sort. 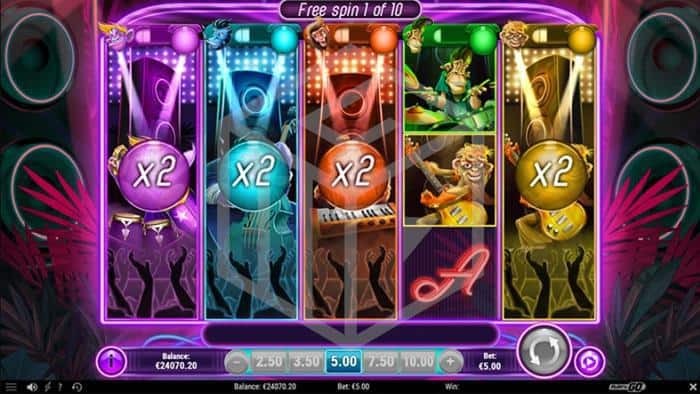 Even better, all the multipliers for each band member which have been accrued throughout the free spins will be added together and the win landed will be multiplied by this total. With 5x multipliers possible for each band member, this could mean up to a 25x multiplier for a guaranteed win. Play‘n Go has succeeded in adding an interesting new twist on the rock ’n’ roll slot theme with a fun design, some innovative features and groovy gameplay. Of course, as a high variance affair, you can take it as a given that you will suffer some lean spells but there’s plenty to keep you entertained. The Rock ‘n’ Rollin’ Respin, for example, rears its head reasonably often for some decent multi-wild wins, and the free spin round offers some nice touches with plenty of scopes to grab additional spins, lots of multipliers to collect, and the anticipation of a potentially huge Encore spin to cap it all off. As with 99% of slots Banana Rock isn’t re-inventing the wheel here, but there’s enough of that famous Play'n Go panache to make sure that this title isn’t just another portfolio filler but rather a genuinely interesting and fun take on a well-trodden path. This game is available on top rated online casinos that are both fully regulated and licensed by the UK Gambling Commission and / or the Malta Gaming Authority. Pick one and grab yourself a great promotion while you check out our best casino bonuses section. We're constantly reviewing new online slots on a daily basis. For more reviews, go to our online slots section.